A Swedish study suggests that women diagnosed with cervical cancer as a result of a smear test have a far better chance of being cured than women who do not go for tests. The study shows a 92% cure rate after a smear test diagnosis, compared with 66% for symptoms-based diagnoses. Published in bmj.com, the study looked at all women diagnosed with cervical cancer in Sweden between 1999 and 2001. The research, carried out at the Karolinska Institute in Stockholm, followed 1,230 women for an average of eight years after diagnosis. 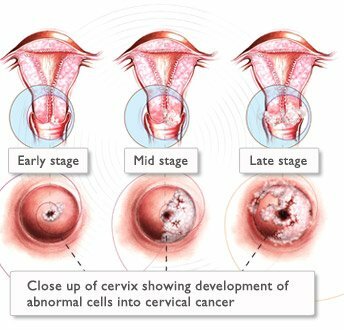 To estimate the chances of surviving cervical cancer, the study analyzed cancers detected by an abnormal smear test result and all other cases based on diagnosis using symptoms. The percentage of women cured after presenting with symptoms within the recommended interval between screenings was 74%. But for women with symptoms who were overdue for screening, this cure rate decreased to 60%. Researchers found that the chances of being cured for all women who had a smear test within the recommended three to five years were 11% higher than for women who were overdue or who had never had a smear test. This is a result of screen-detected cancers generally being found at an earlier stage, the study says. Three-quarters of the 373 women who died from cervical cancer in the Swedish study had not had a cervical smear in the recommended timeframe. Dr. Bengt Andrae, study author and senior consultant gynaecologist at Uppsala University, said that screening both reduced the risk of cervical cancer and was linked with improved likelihood of cure. The Swedish cervical screening programme invites women aged 23-50 to attend every three years and women aged 51-60 to attend every five years.